Groaty Pudding is a traditional Black Country dish. It’s similar to a risotto. The flavour of V Pud works well with this. If you can’t get oat groats, try making it with pearl barley. 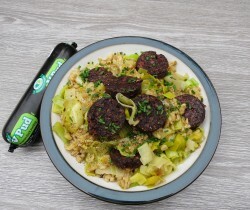 This recipe was designed using our Vegetarian Black Pudding by Our Lizzy Vegetarian Cookery School and takes only 30 minutes. Place the oats groats in a saucepan with the stock, then bring to the boil. Reduce the heat, cover and simmer for about 45 minutes until the groats are cooked. Heat a pan, then add the leeks and cook in their washing water for a couple of minutes. Add some extra virgin rapeseed oil to finish cooking. Add to the groats mixture. Heat some extra virgin rapeseed oil in a clean pan. Test to see if the oil is hot, and add the slices of V Pud. Fry until crispy on both sides. Place on top of the cooked leeks and groats. Garnish with chopped chives.